U.S. News & World Report ranks UTA's graduate programs in engineering, business, nursing, and education among the best in the country based on peer evaluations and the quality of faculty, research, and students. The 2017 Best Graduate Schools list marked a steady rise for UTA's graduate engineering programs, now ranked No. 82 among 215 doctoral-granting engineering schools surveyed. The Master of Science in Nursing saw a significant improvement on the U.S. News list, climbing 15 places from last year to be ranked No. 75. A total of 519 accredited nursing schools with master’s or doctoral programs were surveyed. The College of Business part-time MBA ranked No. 82 among 470 accredited programs surveyed, the first time the college has broken into the Top 100 on the U.S. News list. The Master of Education degree also ranked in the top tier at No. 120 among the 376 doctoral-granting schools surveyed as the nation’s best graduate schools of education. The rise in rankings is evidence of progress toward excellence under UTA’s Strategic Plan 2020: Bold Solutions | Global Impact. Read more about the U.S. News graduate program rankings. Students will show their research and creativity at the Annual Celebration of Excellence by Students (ACES) symposium 8 a.m.-6 p.m. Wednesday, March 23, at the E.H. Hereford University Center. Poster presentations will be in the Bluebonnet Ballroom, and oral presentations are throughout the University Center. An awards presentation begins at 5:30 p.m. in the Rio Grande Ballroom. See the ACES booklet. The second-seeded Lady Movin’ Mavs brought an unstoppable game plan to win the team's first Women’s National Championship, defeating the No. 1 seed University of Illinois 65-51 in the National Wheelchair Basketball Association intercollegiate tournament in Edinboro, Pa.
Rose Hollermann, a 2012 U.S. Paralympian and the 2015-16 NWBA Collegiate Player of the Year, lit up the scoreboard, finishing with 35 points, nine rebounds, and seven assists. Hollermann was named the first Dr. Tim Nugent Tournament MVP for her impressive performance, going 27 for 38 from the floor for 66 points in two games, with 16 rebounds and 12 assists. NWBA founder Dr. Tim Nugent, who died last fall, is credited with disabled sports development throughout the United States and the world. The Movin' Mavs men’s team earned third place, defeating Illinois 63-59 in overtime. The duo of Andy Kraft and Jan Gans combined for 54 points and 21 rebounds. See photos of the Movin' Mavs at the NWBA tourneys. 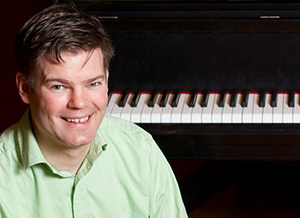 Dan Cavanagh, associate professor of music, wants to prove that music really can work hand-in-glove with technology. He will discuss “Intersections: Musical Improvisation and the Blending of Acoustic and Electronic for Live Performance" at his Focus on Faculty talk noon Wednesday, March 23, on the sixth floor of Central Library. Cavanagh developed fingerless gloves embedded with bend, rotation, and gyroscopic sensors that capture hand movements. The gloves connect wirelessly to a computer running software that maps the stream of sensor data to a library of sounds and controls. If a performer holds their finger up, for example, the gesture introduces a particular sound to the performance. Focus on Faculty is a lecture series highlighting the research of UTA faculty. A reception follows the talk. 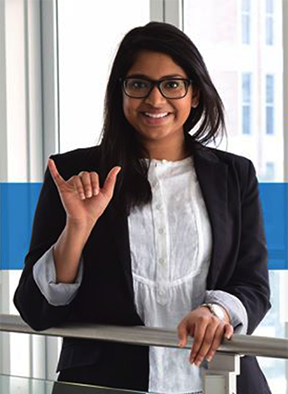 Psychology major Pooja Mallipaddi has been named a student representative to the Texas Higher Education Coordinating Board's Apply Texas Advisory Committee. The committee is made of admissions administrators from Texas institutions of higher education and provides the board with advice and recommendations regarding application procedures and student access to higher education. Joy Frazier, associate director of admissions, also served on the Apply Texas Advisory Committee. Students are invited to meet with candidates for the director of Parking and Transportation Services position. The forums will be noon-1 p.m. Thursday-Friday, March 25-26. Lunch will be served. More meetings are set for Monday, April 11, and Thursday, April 14. 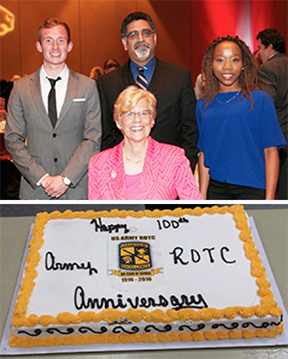 Read President Vistasp Karbhari's notes about the recent Dream Makers Luncheon and 100 years of ROTC at UTA in his blog, Mav Milestones. Check the blog for past campus events and upcoming posts. Silicon Valley investment group Artiman Ventures will hold a two-day session Thursday-Friday, April 7-8, at UTA to brainstorm with faculty, students, and local entrepreneurs on how to help move new technologies to the marketplace. The fundamentals of a startup and what it takes to succeed will be the focus of a seminar 2-5 p.m. Thursday in the Lone Star Auditorium of the Maverick Activities Center. A networking session with speakers and entrepreneurs will follow the seminar. Faculty and students are invited to a series of small group meetings and follow-up sessions Friday in the UTA StartUp Lounge. For information about the sessions, contact Teri Schultz at tschultz@uta.edu. Read more about the technology start-up seminar. Day camps are offered this summer by UTA’s academic and athletic departments. More camps will be added later. Continuing Education hosts camps June 6-Aug. 5 for grades 1-12. Early discounts are available until April 6. Learn more about Kids and Teens University. Baseball Mavericks vs. Baylor. Tickets $5, $3 students. 6:30 p.m., Clay Gould Ballpark. Also, vs. Incarnate Work, 6:30 p.m. Thursday-Friday, March 24-25, and 2 p.m. Saturday, March 26; vs. TCU, 6:30 p.m. Tuesday, March 29. Athletics. UTA Flute Studio and Maverick Flute Choir Concert Free. 7:30 p.m., Irons Recital Hall, Fine Arts Building. Music. University Singers Concert Free. 7:30 p.m., Irons Recital Hall, Fine Arts Building. Music. Game Night Enjoy video games or board games and fresh, hot popcorn. Free. 6-9 p.m., basement, Central Library. UTA Libraries. Friday Night Film: The Hateful Eight Rated R. Free popcorn. Concessions for sale. $2, $2.50 with credit card. 8 p.m., Rosebud Theatre, E.H. Hereford University Center. EXCEL Campus Activities. Track and Field: Bobby Lane and UTA/Bowie Invitational See the schedules. Maverick Stadium. Athletics. 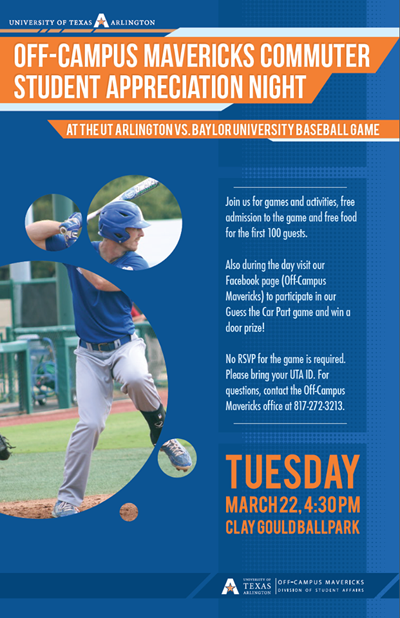 Spirit Week Social Media Challenge, all week; “Get the Scoop” about the UTA Ambassadors, Monday, March 28; tailgate and baseball game, Tuesday, March 29; Mavs Take Over: Grease Monkey and Trivia Night, Wednesday, March 30; canned food drive, Thursday March 31; pep rally, Friday, April 1. UTA Ambassadors. Faculty Vocal Recital with David Grogan Free. 7:30 p.m., Irons Recital Hall, Fine Arts Building. Music. Music Concerts and Recitals Free. Clavier Recital, Tuesday, March 29; Double Bass Studio Recital, Wednesday, March 30; and Faculty Double Bass Recital with Jack Unzicker, Thursday, March 31. All 7:30 p.m., Irons Recital Hall, Fine Arts Building. Music. 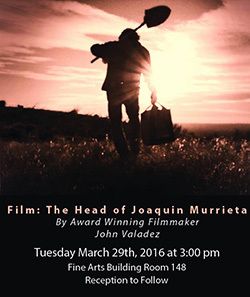 Film screening: 'The Head of Joaquin Murrieta' Filmmaker John Valadez goes on a quest for the remains of Joaquin Murrieta, a legendary Mexican outlaw who was killed by bounty hunters in 1853 and had his head placed in a jar for public display across California. Free. 3 p.m. Tuesday, March 29, Room 148, Fine Arts Building. Center for Mexican American Studies. Maverick Speakers Series "Gombe and Beyond: An Evening with Dr. Jane Goodall." Sold out. 7:30 p.m. Thursday, March 31, College Park Center. Maverick Speakers Series. Glass Art Sale and Show Vases, paperweights, platters, and other glass art by art students and faculty. 8 a.m.-5 p.m., silent auction 2 p.m. Saturday, April 2, Studio Arts Center, 810 S. Davis St. Art and Art History. International Week Soccer tournaments, Saturday, April 2; Parade of Banners, Monday, April 4; International Food Fair, Tuesday, April 5; fashion show, Wednesday, April 6; Global Extravaganza, Friday, April 8. Office of International Education. Gallery 76102 'The More I Build You' Within paintings and drawings, artist Layla Luna constructs and deconstructs spaces and architectural structures. Artist talk, 6-8 p.m. Thursday, March 24. Gallery hours noon-6 p.m. Wednesdays-Saturdays, Fort Worth Center, 1401 Jones St., Fort Worth. Through March 31. Gallery 76102. UTA Libraries: 'Score' Using Special Collections photos, the exhibit showcases the early days of baseball, basketball, and track; the end of Maverick football; and Olympians and Paralympians from UTA. Through April. Also, Academic Evolution: The University of Texas at Arlington runs through August. Sixth floor, Central Library. UTA Libraries. LINK Lab Lecture Series Georg Graetz of Uppsala University in Sweden, “The Polarization of Employment: Explanations and Implications.” Noon, Room 246, Nedderman Hall. 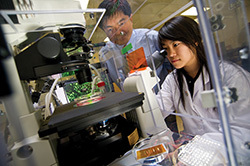 LINK Research Lab. Disability Studies Minor Meet and Greet Learn about the Disability Studies minor program and meet the faculty. Free lunch. Noon-1:30 p.m., Room 104, University Hall. Disability Studies. Documentary Film: 'You Are The One' A documentary about sexual assault on campus. Free popcorn and drinks. Free. 7:30 p.m., Maverick Activities Center. Relationship Violence and Sexual Assault Prevention. RAD Self Defense Class Self-defense course for female faculty, staff, and students. Register online. Free. 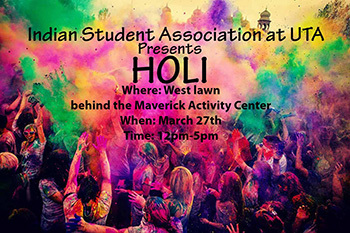 9 a.m.-6 p.m. Saturdays, March 26 and April 9, Room 102-B, Maverick Activities Center. UTA Police. CPR/AED/First Aid Class A single, five-hour class covering the American Red Cross first aid basics, medical and environmental emergencies, adult CPR, and AED use. Registration at MAC Services and Information desk. $50. 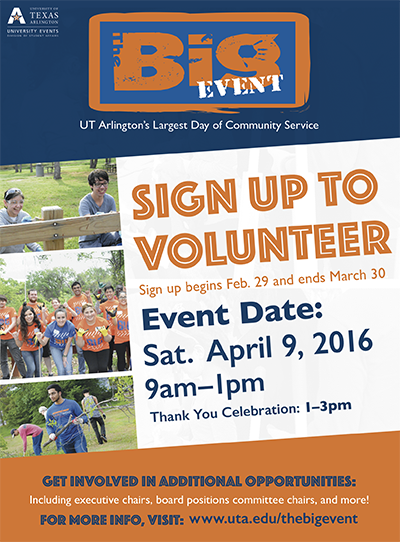 10 a.m.-3 p.m. Saturdays, April 9 and May 21, Room 223, Maverick Activities Center. Campus Recreation. Art Lecture Mohamed Keshavjee of the Institute of Ismali Studies in London, author of Into That Heaven of Freedom: The Impact of Apartheid on an Indian Family’s Diasporic History. 5 p.m. Monday, April 18, auditorium, Architecture Building. Art and Art History. UTA claimed the first postseason victory in program history with a 75-59 victory over Savannah State in the first round of the CollegeInsider.com Tournament. The men's basketball team received a bye through the second round and advanced to the CIT quarterfinals Tuesday-Thursday, March 22-24. The Mavs face New Jersey Institute of Technology on Thursday, March 24, in Newark, N.J. In the Sun Belt Conference Basketball Championships, the Maverick men made it to the semifinals with a 72-63 win against Texas State, but fell 82-71 to Louisiana-Monroe on Saturday afternoon. UTA was playing for its first conference final berth since reaching the WAC championship game in 2013. The Mavericks (24-10) also tied a school record for most victories in a single season after winning for the sixth time in the last seven games. Alexus Henry was the star for the Mavericks at the TCU Invitational, winning the high jump with a mark of 5 feet, 10 inches. UTA hosts the Bobby Lane Invitational for the first time in three years on Saturday, March 26. Maverick baseball plays Baylor at 6:30 p.m. today, Tuesday, March 22, at Clay Gould Ballpark before hosting Incarnate Word in a three-game seiries beginning Thursday, March 24. Softball Lady Mavs claimed a 3-1 victory over No. 5 Louisiana on Sunday. The team opens a three-game series against Georgia Southern at 4 p.m. on Friday, March 25. UTA's men's golf team capped the Bob Sitton Invitational to finish sixth in Las Colinas Thursday. The team travels to West Point, Miss., for the Old Waverly Collegiate Championship beginning Monday, April 4. The Lady Mavs basketball team ended its run in the Sun Belt Conference championship play in the first round with a 59-53 loss to Louisiana-Lafayette. Upcoming intramural sports deadlines are NCAA Sweet 16 bracket challenge and fantasy baseball, Thursday, March 24; sand volleyball, Friday, March 25; badminton doubles, Friday, April 1; table tennis, Thursday, April 21; wheelchair football, Monday, April 25; battleship, Monday, May 2; FIFA video game, Wednesday, May 4; and poker tournament, Thursday, May 5.